For the first time ever, astrophysicists have predicted the time of death for two exoplanets in a single system. Sibling planets Kepler-56b and Kepler-56c are about to be swallowed by their star -- and soon too, by astronomical standards. Their ends will come in about 130 million and 155 million years, respectively. RIP. 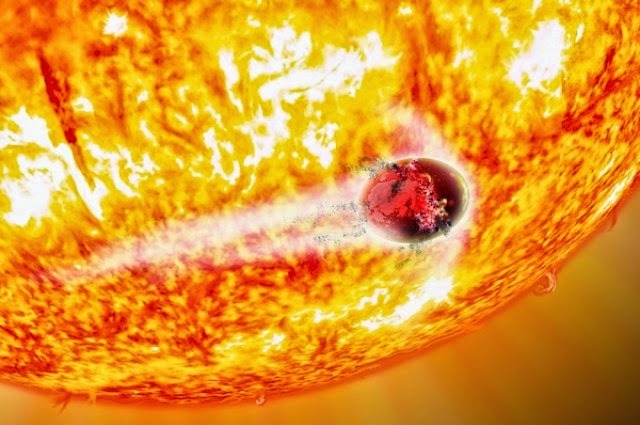 The host star, Kepler-56, is becoming a red giant star: It’s already swelled up to four times the size of our Sun, and it’ll only continue to balloon as it ages. As it gets larger, its tides will get stronger, eventually dragging its planets inward and engulfing them. The Kepler-56 system gives us a glimpse into the future of our solar system: In about five billion years, our Sun will also become a red giant star, expanding outward to immense proportions and engulfing Mercury and Venus. Kepler-56b orbits its star once every 10.5 days, while Kepler-56c orbits every 21.4 days. Since both of those planets are much closer to their star than Mercury is to the Sun, they’ll meet their ends much faster. Using the publicly accessible MESA code, Gongjie Li of the Harvard-Smithsonian Center for Astrophysics (CfA) and her colleagues were able to calculate the evolution of the sizes of the star and the planets' orbits to predict when the planets will be consumed. Before that happens, the two planets will be exposed to intense heating from their steadily growing star. That’ll boil off their atmospheres, while stellar tides will stretch the planets into egg shapes before shredding them. The system’s only survivor will be Kepler-56d. This gas giant circles the star in a 3.3-Earth-year orbit -- a safe distance to witness the inevitable demise of its siblings. The Kepler-56 system has been especially memorable for being the first tilted multiplanet system to be discovered. The orbits of the two inner planets are tipped from the star’s equator: The most probable tilt was either 37 or 131 degrees, this new work shows. Most planets in a single system -- like ours -- form from the same disk of gas and dust as the star, so they orbit in the same plane as the star’s equator. The work was presented at the American Astronomical Society (AAS) meeting in Boston this week.